There’s walking, there’s bicycle riding, and now, dockless electric scooters are joining the ranks as the latest option in urban micromobility. Unfortunately, we have also seen a few walking and bicycling advocates3 parallel this same attitude. While we firmly believe there is no excuse for a rider – whether on a scooter or bicycle – to tear down a sidewalk at any speed that could put a pedestrian at risk,4 we do think the outright vilification of electric scooters outright is terribly misguided. If one looks past stereotypes (and understands that local government does have the ability to make smart policy and regulatory decisions that can support dockless services), one will see a transportation option just waiting to be put to use; one that can provide another first-mile/last-mile option to complement the bicycle. Let’s look at the situation from a blank slate. Like bicycles, scooters bridge the speed gap between walking and driving. Most dockless scooters are capped at 15mph5 – just a bit faster (or slower) than someone bicycle commuting6 – and near enough to the speed of bicycle riders that slowing down around others does not require an outright panic stop. Likewise, the space necessary to maneuver a scooter is not much different, and their footprint is smaller than most bicycles. …as a vehicle of small size and weight, dockless scooters – like bicycles – can provide yet another alternative to motor vehicle use in the city, and thus reduce severe crashes between human beings and two tons of needlessly dangerous machinery careening about our cities at 30 miles an hour. As such, motorized scooters are suited to the same protected bike lanes that currently dominate the conversation of safe, urban bicycle infrastructure – certainly more so than “speed pedelec”7 e-bikes, at any rate. Considering that these bike lanes not only serve bicycle riders but also provide an alternative when sidewalks fail people using wheelchairs and mobility scooters (to be clear – a nationwide issue, not just in Florida), the pairing is a natural fit. This is not to say protected bike lanes are by any means a substitute to proper ADA compliance in the first place, but their existence provides a much safer fallback than ostensibly “sharing the road” with cars when a curb is insurmountable or a sidewalk is completely impassable. In addition, as much as we love bicycles, the scooter might have a stronger mass appeal in the long run.8 Unlike bikeshare, motorized scooters conjure up an image of effortless transportation, free of pedaling and sweat. While this allure may irk public health advocates hoping to increase physical activity through cycling, one must consider that scooters can be a public health benefit from a long-term, holistic standpoint. For one, scooters encourage less automobile dependency in the city for short trips, thus reducing the possibility of automobile-involved crashes and overall emissions (depending, of course, on a city’s size, scooter popularity, and the most common types of trips made in that region). Second, by providing the infrastructure and opportunity for scooter users, opportunities (by virtue of said shared infrastructure) open up for bicycle riders as well, making the active option more inviting. Of course, this is textbook incrementalism, but by working off a popular platform (the scooter), political will and community support for active transportation could be gained much quicker than by advocating for bicycles alone. “(1) Except as provided in s. 316.008 or s. 316.212(8), a person may not drive any vehicle other than by human power upon a bicycle path, sidewalk, or sidewalk area, except upon a permanent or duly authorized temporary driveway. Thus, scooters are a Catch 22 in Florida until both 316.2128 and 316.1995 are revised by the State. 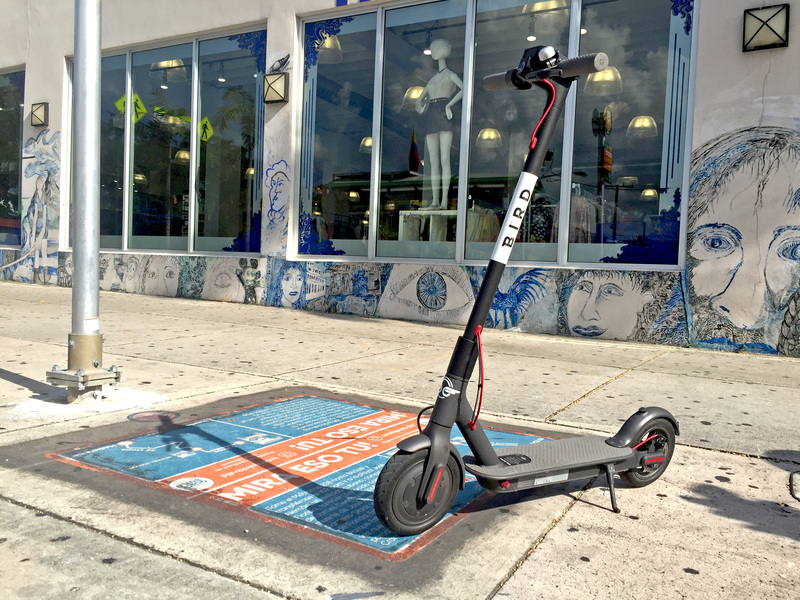 Since then, Mayor Suarez has stated on Twitter that the city is drafting legislation to propose their use, while Coral Gables beat the entire state to the finish line as the first city in Florida to issue a permit to a dockless company for scooter operation. Granted, no article to-date has explained how this trial works within the existing Florida statutes, but we are glad to see these cities take the initiative. Ideally, we hope these combined efforts will influence future legislative changes in favor of micromobility options. Nevertheless, despite all the benefits, some pedestrian advocates still argue that dockless scooters do not deserve any consideration, as they create obstructions for people in wheelchairs or mobility scooters. Often cited as the exclusive fault of scooters alone, this argument overlooks that our existing sidewalks are frequently unreasonable for wheelchair users, and have been so long before dockless scooters reignited the conversation of space equity. Thing is, unlike objects cemented or bolted into the ground – which require engineering, planning, and a piece of the infrastructure budget before they move an inch – dockless scooter (and bicycle) obstructions are easily overcome with a simple solution first seen in Seattle16 and now in Austin, Texas – dedicated dockless parking spaces. A simple solution to a simple problem. If only moving bus stop advertisements, trash cans, light poles, and fire hydrants were as easy as putting down a bit of paint. Additionally, the dockless aspect shines a brighter spotlight on the need to fix inequitable street access outside of bicycle lanes alone. But perhaps most importantly, as a vehicle of small size and weight, dockless scooters – like bicycles – can provide yet another alternative to motor vehicle use in the city, and thus have the potential to reduce severe crashes between human beings and two tons of needlessly dangerous machinery careening about our cities at 30 miles an hour. Put simply, there are no major downsides if our cities properly accommodate scooters (and bicycles) with protected lanes and if new legislation legalizes their use in a fair and supportive manner. The future is in our hands. Let’s create it wisely. NOTE: In light of the recent letter to the editor from LimeBike to the Miami Herald19, we wish to clarify that the article above and the views expressed herein are exclusively the position of our programs and staff. We did not speak with any company providing dockless scooter services for the purposes of this article, nor have we received any compensation for the points of view expressed herein.